We all want to do what's right for our environment and make intelligent lifestyle choices that will help relieve our dependency on natural resources. Our partnership with Pinnacle Stoves allows you to do this and more. The Eco-fit bio energy fuel design addresses your objectives to decrease dependence on non-renewable energy sources. We can provide you with one of these environmentally friendly heating systems for residential and industrial/commercial applications. 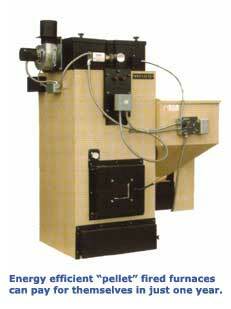 The "Eco-fit" heaters can run on many types of renewable and biomass fuel sources. Choose from a variety of pellets types including wood shavings, organic grasses, recycled paper, nut shells, cardboard, and corn stalks. These pellets are compressed using a mechanized press process then burned in the Eco-fit home or commercial furnace. Pinnacle Pellet Furnaces is a name you can trust and has been involved in bio-energy research & development for well over 10 years, manufacturing residential and commercial pellet furnaces all over the world. Engineered to meet or exceed air quality standards, our pellet fired furnaces effectively and efficiently performed without the emissions of your typical wood furnaces. In fact the emissions of the pellet fired furnaces are so low they are EPA exempt. Over the years, the Pinnacle line of home and commercial heaters have evolved into the new Eco-fit systems of furnaces and boilers, providing you with super clean, and efficient heating. So get off the grid, save money and do your part for the environment with one of our eco friendly heaters. For more information on pellet heaters please complete the following short form and we'll get back to you with pricing, and other important information.